Molly's Musings: Did Jackie O Color Outside the Lines? My musing continues on Elfriede Jelinek’s Jackie a week later. I find myself still pondering its form, its message, and the fact that it’s still riffing in my head. Tina Benko is vaguely creepy and very amusing in Elfriede Jelinek’s Jackie playing at the Women’s Project Theater at City Center. 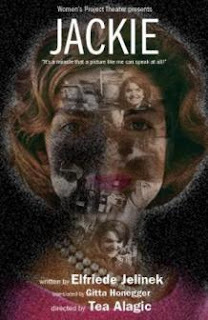 But is she Jacqueline Bouvier Kennedy Onassis, or merely a vehicle for the themes Ms. Jelinek’s been writing for most of her career? Ms. Jelinek’s script is obsessed with the clothing, the look, the public figure hiding behind the men in her life like a properly brought up society matron. The excellent lighting design by Brian H Scott is compelling, sound design by Jane Shaw startling. The scenic design by Marsha Ginsberg is … not pretty. It might have been a neglected basement pool in a shuttered YMCA or a lost subway station. It is unkempt, dried autumn leaves and other detritus having made their way in. It may stink of death. A metal trap door is lifted upstage. Tina Benko climbs into the set wearing a neatly pressed trench coat, a silk scarf perfectly covering her perfectly coiffed wig, large Jackie-style sunglasses camouflaging her face. She is in disguise but in such a Jackie way we know it’s her. The outfit by costume designer Susan Hilferty is quintessential Jackie O, as is the wig by Tom Watson. This Jackie is mischievous; it’s almost as if she’s escaped (the nanny? paparazzi?) and stolen away for a moment to talk with us. From the trap door, she drags a duct-taped covered faceless dummy, then another, and another, bound together by strips of fabric. Then we see three small dummies, infant-sized, and now we know that, not unlike Jacob Marley’s chain that he forged in life, Jackie wears Death. She knows she’s dead. She knows everybody’s dead, including people who died after she did. She talks to us for almost an hour and a half about herself, about Jack, about Teddy, and the other Kennedy wives. We explore as much of her life as she chooses to share. It’s not new. We’ve heard all the names before and most of the rumors. Why is she here? Jackie is not traditional. Throughout the evening, I listened for a theme, a through-line, but only heard the elements, connected, disconnected, that ramble and run and repeat in the soundtrack of this woman’s memory. Clothing, death, the babies, Jack, Bobby, Ari. Clothing. The dresses. The design. The appearance. Appearance, that fallback position of the female, the way society expects her to look. While I’m not strictly a traditionalist, I do take comfort in established forms. Jackie isn’t really a play in the traditional sense. It’s a one-woman show offering Ms. Benko the opportunity for a bravura performance which will be remembered and spoken of for seasons to come. Ms. Benko relishes the musical quality of the words, the conversation, the occasional rant — from which Jackie reins herself back into a well-mannered society girl. The script is brisk, flowing, poetic, so I must assume Gitta Honegger’s translation is sterling, and director Téa Alagic has staged the work very well. Thing is, a play, to me, has a beginning, middle, and end. Structure matters, just as the structure of a good genre novel keeps people reading their predictable suspense, romance, crime, and mystery novels and reaching for more. While enjoying a twist and a turn, they expect the story to eventually conform to the traditional form. Ms. Jelinek does not oblige. Jackie has a beginning, but the rest is essentially the same tune. It made me think of a roundelay, the words repeating with new and overlapping voices, the chorus always about the clothes. Whatever this form is — musical terms come to mind, which makes a certain sense, since Ms. Jelinek was trained in music in her youth — Jackie’s hypnotic hold is aural. Jackie’s meanderings and driven crosses — often back to that intriguing trap door — hold our interest and are not forced, even if we don’t know the wherefores. What could we know, after all, of Jackie’s No Exit? And wherever she goes, they go, those odd duct-taped dummies Jackie lugs around the playing area. One is labeled Jack, one Bobby, one Telis — apparently a pet name for Onassis. The most interesting aspect of Jackie’s growth after death is the change in her feelings toward Marilyn Monroe. “Marilyn” is first referred to and not named while clearly disparaged, then the name is fairly growled and spat. By the end of the evening, though, Jackie commiserates with Marilyn as one who was trampled underfoot by the masculine society that bound Jackie herself. Jackie was stronger, maybe smarter and not as soft, so she survived longer. By including Jackie O in her dramatic series “Death of the Maiden – Princess Plays,” Jelinek compares, even equates Jackie with fairytale princesses like Snow White and Sleeping Beauty, as well as Marilyn. Ms. Jelinek’s work is rarely done in the U.S., nor is it included in university curricula. What’s that about? Might she be feared? Contrarily, I’ve already ordered the only English language translations I found online (also translated by Ms. Honegger), a few of the Princess Plays in a theatre magazine. Modern retellings of fairy tales (there are so many modern feminist interpretations of fairytale heroines and villains, I almost don’t need to know Ms. Jelinek’s in particular) deal with the female self image, submission to societal powers (that is, men) that control the life and death of females; most try to clarify that men wrote down those old stories, those are men’s teachings and interpretations of women’s actions: disapproving, frightened, insecure men. The retellings sometimes explain what those horrid old women were doing and why. Scholarly men’s views and fears are stamped on all the old stories, and thereby stomp on the females in the stories, not to mention the females reading them. This subject is interesting enough to make me wish to read all five of Jelinek’s princess plays — but not while I’m at the theatre. And that’s my point. That’s what’s been buzzing around in my head. Should the audience be expected to be well versed in the prior writings of a playwright in order to fully understand and appreciate the play viewed at the moment? Me, I think not. Knowing a little something more than I did before about Elfriede Jelinek makes Jackie appear a better play, but should it? Is it? And then there are the Barbie® dolls. Not all productions can claim an effective use of Barbie dolls; this one can. ~ Molly Matera, signing off, recommending the Women’s Project Theater’s production of JACKIE to people who like to open up new cowpaths. Really good column, Molly. I'm with you on the structure thing. I'm reminded of the late sixties jazz movement, epitomized by Sun Ra, Albert Ayler, and John Coltrane. Trane, of course, started out as melodic and structured as anyone, but, toward the end.... The Filmore East was the venue I saw him at, during that period and, after sitting through a half-hour of honks and squeaks (and who the hell ever included a bata drum in his jazz ensemble? )I went down to the lobby to smoke. There I found about a dozen of my musician friends, all having had enough. There's an introductory book about mainstream jazz called "Where's the Melody?" I felt I could write one called "Where's the Goddamned Sense in All This?" In a play, in a movie, in a joke, even, I want a story. And making a point is always much appreciated. Thanks for your kind comment on the column, and your interesting comment on the need for story, melody, structure, whatever the medium. I could use an introductory book about mainstream jazz, and now I know which one to read. Of course, I'd also read the title you suggest!